As you can see all the principles are back... Matt's still day dreaming, Harry's a little angrier, Sally's tougher and Bill's not dead! So far people are saying this second installment is at least as good as the first but I have to agree with those people who still like the first better. I do too. What's also interesting is that people are asking me about creating a prequel to the first Harry Chalk. I'm not sure what a prequel would contain so I asked GoAnimator, HuskyPup, who said "Personally I would like to know if Mathew's imaginings are real or pretend, because something niggling in the back of my brain tells me they're real." From my point of view I hadn't really thought about it. Most of what Mathew sees is all in his head. He just gets so caught up in the story that he forgets where he is. Although it has crossed my mind to do an episode where Matt's imaginary characters do battle with another students imaginary characters - so who knows... maybe it's not all just in his head after all? There's not too much behind the scenes stuff to explain about Harry Chalk 2. The only new technique I employed was when Harry takes out and puts away his pistol. 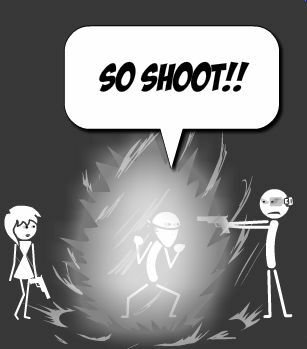 This was achieved simply by using the stick figures take out and put away mobile phone actions - timing them slightly shorter so that Harry never puts a gun up to his face and starts talking. Sally's gun kick was done the same way as Harry's in the first episode so if you want to know how then read the first episode's post. I will say that I had thought of changing Bill's weapon to a shot gun and have Sally do the same kick to get the shot gun but by the time I thought of it there were just too many scenes of Bill and the pistol and I was already over my release deadline. Maybe in a future episode. Speaking of future episodes, I still haven't achieved what I originally set out to do with Harry Chalk. That was to do a really good stick figure fight scene. There was kind of a fight scene with Bill in the first episode but that's not the fight I had in mind. I really wanted to do a cool three way fight with the Parallel Triad from episode one. Having not achieve a great fight you can bet there will be a Harry Chalk three some time in the future.